Yunnan (云南) is a province of the People's Republic of China. Located in Southwest China, the province spans approximately 394,000 square kilometres (152,000 sq mi) and has a population of 45.7 million (as of 2009). The capital of the province is Kunming, formerly also known as Yunnan. The province borders the Chinese provinces Guangxi, Guizhou, Sichuan, and the Tibet Autonomous Region, as well as the countries Vietnam, Laos, and Myanmar. In 221 BC, Qin Shi Huang unified China and extended his authority south. 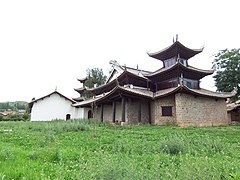 Commanderies and counties were established in Yunnan. An existing road in Sichuan – the "Five Foot Way" – was extended south to around present day Qujing, in eastern Yunnan. The Han–Dian wars began under Emperor Wu. He dispatched a series of military campaigns against the Dian during the southward expansion of the Han dynasty. In 109 BC, Emperor Wu sent General Guo Chang (郭昌) south to Yunnan, establishing Yizhou commandery and 24 subordinate counties. The commandery seat was at Dianchi county in present-day Jinning. Another county was called "Yunnan", probably the first use of the name. To expand the burgeoning trade with Burma and India, Emperor Wu also sent Tang Meng to maintain and expand the Five Foot Way, renaming it "Southwest Barbarian Way" (西南夷道). By this time, agricultural technology in Yunnan had improved markedly. The local people used bronze tools, plows and kept a variety of livestock, including cattle, horses, sheep, goats, pigs and dogs. Anthropologists have determined that these people were related to the people now known as the Tai. They lived in tribal congregations, sometimes led by exiled Chinese. ^ Dardess, John W. (2003). "CHAPTER 3 Did the Mongols Matter? Territory, Power, and the Intelligentsia in China from the Northern Song to the Early Ming". In Smith, Paul Jakov; von Glahn, Richard (eds.). The Song –Yuan-Ming Transition in Chinese History (PDF). Cambridge: Harvard University Asia Center. p. 111. ISBN 9780674010963. Anning (simplified Chinese: 安宁市; traditional Chinese: 安寧市; pinyin: Ānníng) is a county-level city under the jurisdiction of Kunming, the capital of Yunnan province, China. It is located approximately 28 kilometers southwest of Kunming city proper. In 1995, Anning was upgraded to a county-level city from a county. Baoshan (Chinese: 保山; pinyin: Bǎoshān, historically also Yongchang) is a prefecture-level city in western Yunnan province, People's Republic of China. Baoshan is the second-biggest metropolitan area in western Yunnan after Dali. 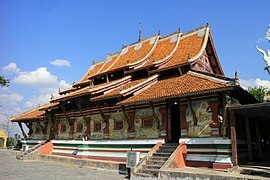 Bumang (Chinese: 布芒语) is a tonal Austroasiatic language of Yunnan, China. It is spoken by about 200 people in Manzhang 曼仗, Mengla District 勐拉地区, Jinping County, Honghe Prefecture, Yunnan, China. Bumang was only recently discovered by Chinese linguist Dao Jie in the mid-2000s. It is closely related to Kháng (Edmondson 2010). Dali City, formerly known as Tali, is the county-level seat of the Dali Bai Autonomous Prefecture in northwestern Yunnan. Dali City is administered through 12 township-level districts, two of which are also commonly referred to as Dali. Xiaguan (下关镇) is the modern city centre and usually conflated with Dali City by virtue of being its seat. This town is the destination of most long-distance transportation heading to Dali and is sometimes referred to as Dali New Town (大理新镇) to avoid confusion. Dali Town (大理镇) is another division of Dali City, located 10 km (6.2 mi) to the north of Xiaguan. This town, commonly referred to as Dali Old Town (大理古城) to distinguish it from the city seat in Xiaguan, is usually the Dali referred to in tourist publications. The old town is one of the most popular tourist destinations in Yunnan, known for its natural scenery, historical and cultural heritage, and vibrant nightlife. Dongwang Tibetan is a Tibetic language of Yunnan, China, once considered a dialect of Khams. It is spoken in the eastern part of Shangri-La County along the Dongwang River by about 6,000 people. Erkuai (Chinese: 饵块; pinyin: ĕrkuāi) is a type of rice cake particular to the Yunnan Province of southwest China. The name literally means "ear piece," a reference to the shape of one of its common forms. It is often served stir-fried with vegetables, and málà (麻辣) sauce, which is a mixture of dried red chilis, Sichuan pepper, and salt. It is also sold as the popular street food kăo ĕrkuāi (烤饵块) or shāo ěrkuāi grilled and rolled around a yóutiáo (strip of fried dough), with sweet or savory condiments added, making a rolled-up snack resembling a Mexican burrito. The sweet type contains a sweet brown sauce and peanuts, while the savory type is spread with lǔfǔ and bean sprouts, and various other toppings. Kăo ĕrkuāi is particularly popular in the tourist area of Dali. 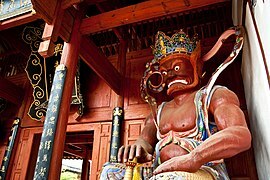 Its peculiar name has led to it being called one of the Eighteen Oddities in Yunnan. Kaiyuan (simplified Chinese: 开远; traditional Chinese: 開遠; pinyin: Kāiyuǎn) is a county-level city within the jurisdiction of Honghe Hani and Yi Autonomous Prefecture in the southeast of Yunnan province, China. Kunming is the capital and largest city of Yunnan province in southwest China. Known as Yunnan-Fu until the 1920s, today it is a prefecture-level city and the political, economic, communications and cultural centre of the province as well as the seat of the provincial government. Kunming is also called the Spring city due to its weather. The headquarters of many of Yunnan's large businesses are in Kunming. It was important during World War II as a Chinese military center, American air base, and transport terminus for the Burma Road. Located in the middle of the Yunnan–Guizhou Plateau, Kunming is located at an altitude of 1,900 metres (6,234 feet) above sea level and at a latitude just north of the Tropic of Cancer. Kunming has as of 2014 a population of 6,626,000 with an urban population of 4,575,000, and is located at the northern edge of the large Dian Lake, surrounded by temples and lake-and-limestone hill landscapes. Lami (autonym: la˨˩mi˥ in Honghe County, meaning 'low status'; Chinese: 腊米) is a Southern Loloish language of Yunnan, China. Lami is spoken in Jiangcheng Hani and Yi Autonomous County, Mojiang Hani Autonomous County, Jinping Miao, Yao, and Dai Autonomous County, and Honghe County. Lami is also spoken in Hade 哈德, Sanmeng Township 三猛乡, Lüchun County.The Lami language has been documented by Zhang (1998) and Wang (2011). China's busiest airports are a series of lists ranking the one hundred busiest airports in China according to the number of total passengers, including statistics for total aircraft movements and total cargo movements, following the official register yearly since 2000. The data here presented are provided by the Civil Aviation Administration of China (CAAC) and these statistics do not include the results for the special administrative regions of Hong Kong and Macau, or the disputed region of Taiwan. Both Hong Kong and Macau have their own civil aviation regulators (the Civil Aviation Department and the Civil Aviation Authority respectively); Taiwan also has its own civil aviation regulator (the Aviation Safety Council). The lists are presented in chronological order starting from the latest year. The number of total passengers is measured in persons and includes any passenger that arrives, depart or travel on transit in every airport in the country. The number of total aircraft movements is measured in airplane-times and includes the departures and arrivals of any kind of aircraft in schedule or charter conditions. The number of total cargo movements in metric tonnes and includes all the movements of cargo and mail that arrives or departs from the airport. Pu'er or pu-erh is a variety of fermented tea produced in Yunnan province, China. Fermentation in the context of tea production involves microbial fermentation and oxidation of the tea leaves, after they have been dried and rolled. This process is a Chinese specialty and produces tea known as 黑茶 hēichá (literally, "black tea") commonly translated as dark tea. This type of tea is different from what is known as black tea in English, which in Chinese is called 红茶 hóngchá (literally, "red tea"). Pu'er traditionally begins as a raw product known as "rough" máochá (毛茶) and can be sold in this form or pressed into a number of shapes and sold as "raw" shēngchá (生茶). Both of these forms then undergo the complex process of gradual fermentation and maturation with time. The wòduī (渥堆) fermentation process developed in 1973 by the Kunming Tea Factory created a new type of pu'er tea. This process involves an accelerated fermentation into "ripe" shóuchá (熟茶) which is then stored loose or pressed into various shapes. The fermentation process was adopted at the Menghai Tea Factory shortly after and technically developed there. The legitimacy of shóuchá is disputed by some traditionalists in contrast to aged teas. All types of pu'er can be stored to mature before consumption, which is why it is commonly labeled with the year and region of production. The Red River (simplified Chinese: 红河; traditional Chinese: 紅河; pinyin: Hóng Hé; Vietnamese: Sông Hồng), also known as the Hồng Hà and Sông Cái (lit. "Mother River") in Vietnamese and the Yuan River (元江, Yuán Jiāng Nguyên Giang) in Chinese, is a river that flows from Yunnan in Southwest China through northern Vietnam to the Gulf of Tonkin. According to C. Michael Hogan, the associated Red River Fault was instrumental in forming the entire South China Sea at least as early as 37 million years before present. 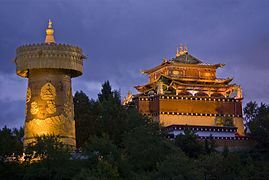 Shangri-La or Xianggelila is a county-level city in northwestern Yunnan province, People's Republic of China and is the location of the seat of the Diqing Tibetan Autonomous Prefecture. Va is a pair of Angkuic languages spoken in Mojiang Hani Autonomous County, Yunnan, China. Although the Va autonym is vaʔ˥˩, the language is not Wa, and neither does it belong to the Waic language subgroup. Rather, Va constitutes a separate subdivision within the Angkuic languages. Northern Va (about 2,000 speakers): spoken in Taihe Administrative Village 太和村, Jingxing Township 景星乡, Mojiang County, Yunnan, China. Northern Va is spoken by all generations, including children. Southern Va (about 1,000 speakers): spoken in Zhenglong Administrative Village 正龙村, Jingxing Township 景星乡, Mojiang County, Yunnan, China. Southern Va is more endangered and is not spoken by children, but is also more phonologically conservative. Xishuangbanna Gasa International Airport (IATA: JHG, ICAO: ZPJH) is an airport serving Jinghong, Xishuangbanna Dai Autonomous Prefecture, Yunnan, China. It is also known as Jinghong Airport (景洪机场). Xuanwei (Chinese: 宣威; pinyin: Xuānwēi) is a county-level city in the northeast of Yunnan Province, China, bordering Guizhou province to the east. It is under the administration of the prefecture-level city of Qujing.